NEW YORK, Jul 27, 2011/ — Celebrated runway designer Nicole Miller partners with the nonprofit Indego Africa to launch a colorful and exclusive line of fair-trade shorts and sarongs to complement their already existing line of textile bangles and woven bracelets. Indego Africa is an innovative social enterprise that partners with more than 250 women artisans in Rwanda, Africa on a fair trade basis to help them build relationships with and fill orders for high-end retailers. 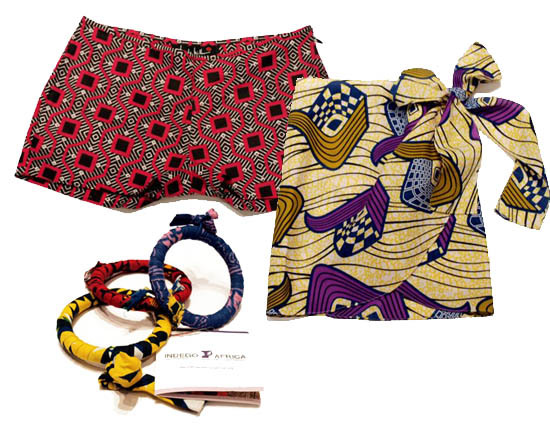 The bright sarongs and colorful printed shorts are created with four different, vivid African fabrics that were hand selected from the markets in Rwanda. The original partnership began in September 2010 when Miller collaborated with Indego Africa on the bracelet design. In May 2011, The Fair Trade Federation awarded Indego Africa the 2011 award for “Excellence in Product Design” for the design of the textile bangles and woven bracelets. Each Textile Bangle is wrapped with vibrant African fabrics, and each Woven Bracelet is hand-stitched with needles and sisal fibers using traditional Rwandan techniques. The dyes and elements used to create the bracelets are natural and non-toxic for the women. This innovative joint venture has thus expanded into a line of colorful sarongs and shorts, just in time for the summer season. “I am so proud to have had the opportunity to partner with such an inspiring organization that empowers African women and to help spread the message of Indego Africa. I’ve always loved the vibrancy and hand-crafted feel of African prints and textiles. Working with different fabrics and prints is a big part of what I do. With my collections, we use digital technology and graphics to create prints so using African textiles was a nice departure from that. I think people like wearing things that feel organic and not like they’re produced in a factory somewhere” says Nicole Miller. All items are available for purchase online at www.nicolemiller.com and the Nicole Miller Miami boutique (656 Collins Avenue Miami Beach, FL). 15% of the proceeds are donated to Indego Africa and quantities are limited.